Rendering of proposed 22-story tower at Pier 34, located at 735 South Columbus Boulevard. 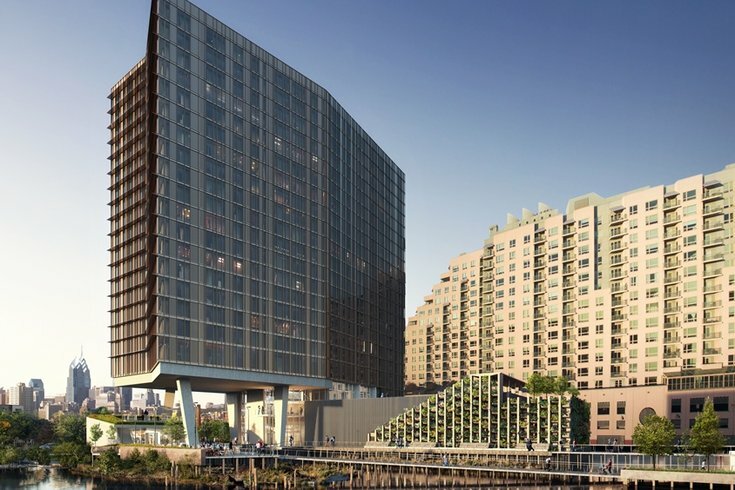 Developers are reportedly in the early stages of planning a massive residential tower at Pier 34, the former site of a deadly nightclub collapse along the Delaware River in 2000. The proposal from Ensemble Real Estate Solutions and Investments, first reported by the Inquirer, calls for a 22-story building at Pier 34, where three women were killed and dozens injured after a 91-year-old structure supporting Club Heat crashed into the river. As a result of the collapse, the owner of the pier and the manager of the nightclub were both criminally charged for failing to address known structural dangers at the site. They both pleaded guilty and served sentences including house arrest and community service. For the past 18 years, the pier at 735 S. Columbus Blvd. has remained vacant and partially underwater as other plans to redevelop there have failed to stick. This proposed redevelopment of an historic Delaware riverfront pier will feature high-end, for-lease residential, as well as a market-restaurant at Pier 34 overlooking a new public park and a river deck at Pier 35 featuring a seasonal beer garden. The project will present a dynamic way of life on the Delaware River Waterfront near Philadelphia’s city center, and join Spruce Street Harbor Park and Fringe Arts as a dynamic public gathering place upon the six-mile Delaware River Bike & Pedestrian Trail. The proposal comes at a time when city officials and outside investors are renewing their efforts to make more of Philadelphia's waterfront real estate. Last year, Mayor Jim Kenney unveiled plans for an 11-acre park capping I-95 all the way to the river at Penn's Landing. The Delaware River Waterfront Corporation is also overseeing the multi-decade Master Plan for the Central Delaware, which includes plans for an extensive network of trails and pier improvements. Premier New York City Real Estate developer The Durst Organization last year acquired multiple pier properties in a $21.4 million deal, claiming the purchase reflected the firm's "bullish thinking" on Philadelphia's long-term development and waterfront potential. There were no immediate details about a timeline for the Ensemble project.